Another lazy weekend review. Too much sun exposure! 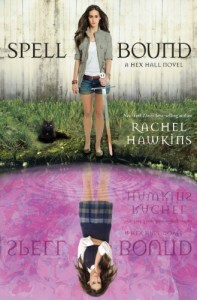 My normal rambling in reviews will make a comeback soon, I'm sure.I liked Spell Bound but it didn't have the same zing as the first two books. It took a good 20 to 25% for me to even find myself invested. I'm not sure if it was a good idea to wait so long to bring back Archer and Cal. The whole Cal as a ghost thing did irritate me. I felt like that story could have wrapped up in a different way.